The inCASA project is a 39-months project funded by the European Commission with the aim to create and demonstrate citizen-centric technologies and a services network that can help and protect frail elderly people and prolong the time they can live well in their own homes. The goal will be achieved by a series of pilots across Europe that integrate solutions and services for health and environment monitoring in order to profile user behaviour. Data will be made available to professional care service providers including privacy protection; day-by-day activity planning; co-ordination of Public Social and Health Care Services; and deployment of specialist community based services. The high level knowledge deployed within the framework of inCASA will be distributed to the research community by publication of the most significant achievements in top quality conferences and scientific journal. The members of the project will write both academic and technical papers, to be presented at conferences and trade shows, and published in leading academic medical and technical journals. Quality of life is an extended concept aiming at evaluating life with all its aspects. That is why it is considered within the field of interest of almost every scientific discipline, life practice and activity in society. Quality of life is the quality of the relations (active and passive relations) between an individual and his surrounding, with its both objective and subjective extents. 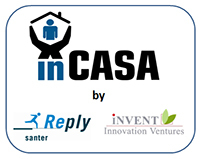 Increasing the quality of life is one of the main objectives of inCASA project. inCASA pilots wants to demonstrate how the use of information and communications technologies (ICT) helps providing better quality healthcare throughout the existing or upcoming local experiences, at a stable or lower cost, and to reduce waiting times and errors. The Pilots will be implemented by putting together and involving Health Local Agencies, Doctors, Engineers, Psychologists and all the Care-Givers concerned with the elderly. Ageing population is one of the most important challenges faced by governments at local, regional, national and European levels. inCASA aims at developing a system that will support the aging population and facilitate them to stay well at their own homes.